It's cold. It's wet. It's gray. We are under House Arrest here until the weather clears. So what's to do? Why, Play With Poems, of course. As you know, we love Sharlot Hall and her poems, especially her 1911 book "Cactus & Pine." Well, since we are confined to quarters here today, we've been playing with poems. First, we found that Google has scanned in "Cactus & Pine." I think we already knew this and put up something a year or so ago but today's playing with poem took us to the next level. Anyway, we figured out to download the book, and then to print just specific poems as PDF and then how to convert the PDF to a JPG so we could post it here as a picture. SWEET! 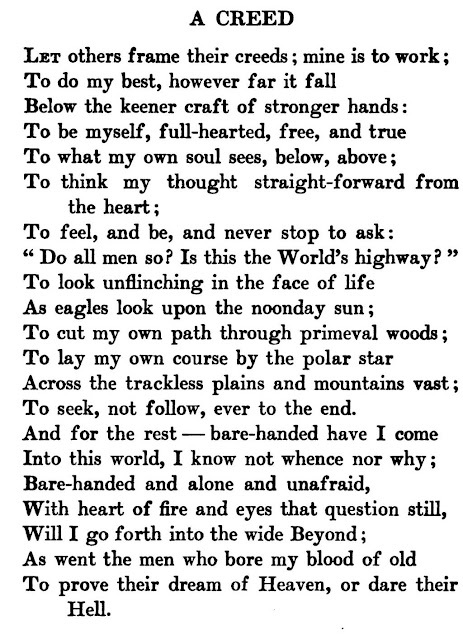 Our favorite poem is below precisely the way it appears in the 1911 First Edition. Sweet, huh?